in a base of plant digestive enzymes to enhance the utilization of the ingredients. Demulcent botanical formula for GASTRIC/INTESTINAL mucosal Healing eg., ulcers, gastritis, permeability defects, IBS, IBD, Crohn's, colitis heartburn, acid regurgitation, chronic use of antacids. 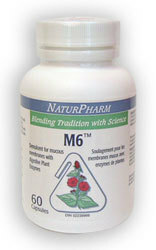 Note: Best used with M2 digestive enzyme formula. 1 or 2 capsules or more as needed, taken 4 times daily between meals (at least 1/2 hour before or 2 hours after).